Papyrus codex containing the Gospel According to John in Coptic (proto-Bohairic). 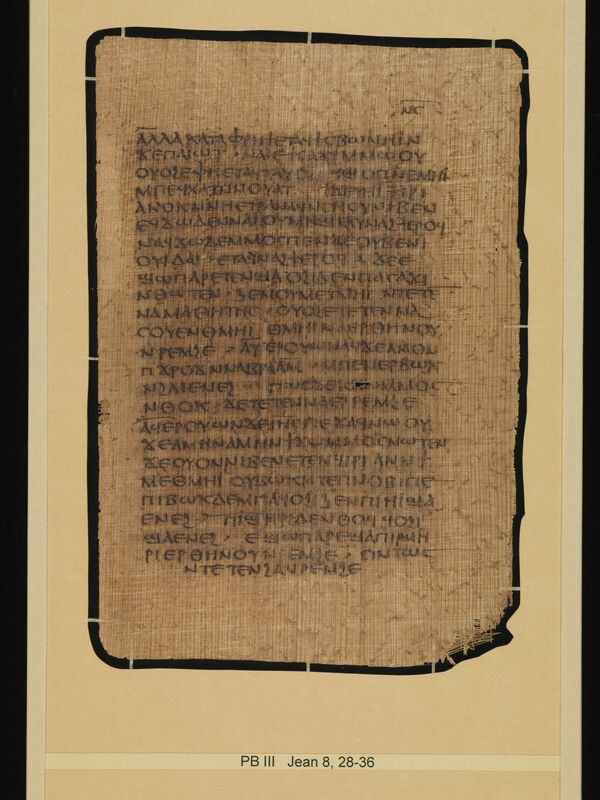 Description: The remains of this codex consist of 72 identifiable papyrus folios and numerous fragments. The original codex would have contained a complete copy of the Gospel According to John and Genesis 1:1-4:2 in proto-Bohairic. The leaves of this codex have been separated and mounted in glass plates. Only the middle leaves of the fourth quire still form a sheet, the other leaves are mounted individually. In addition to the 72 leaves under glass this collection also has three plates of fragments. Most of the first quire is missing with only fragments of the first and last pages of the quire remaining. 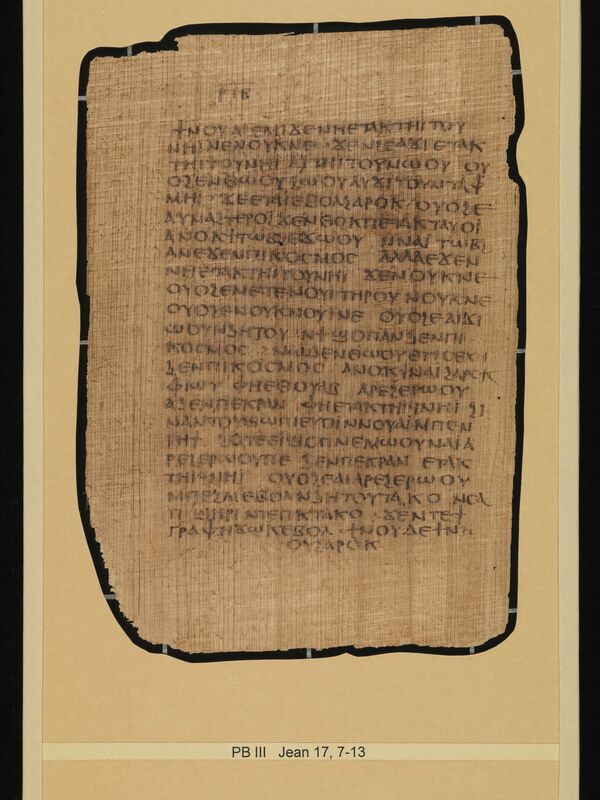 The Gospel According to John appears first in the codex and ends halfway through a page. The verso of that page is blank. Genesis begins on a new page. The papyrus was partially worn at the time of the original text as evidenced by the way the scribe writes some words around tears in the papyrus (for further description see Sharp, Papyrus Bodmer III, 17). Robinson states that P.Bodmer 3 was brought to Geneva in September of 1955 by Phocion Tano along with P.Bodmer 2 (Robinson, The Story of the Bodmer Papyri, 40-41, 164). CopistesThere are 2 discernible hands in this manuscript. Both hands write in a Biblical Majuscule using uniform characters. The second hand is responsible for a single page of text, page ⲛ̅ⲅ̅ (page 53). The reason this single page would be written by another scribe is unclear. Kasser calls the main scribe “rather clumsy” (“assez maladroit”; Kasser, Papyrus Bodmer III, i; Orsini, “I papiri Bodmer,” 77). Dimensions: The width of the page is 15.0 cm. The height of the page is 21.5 cm. The ratio of the page (width/height) is 0.698. The writing is in a single column. The width of the written area is about 10.5 to 11.0 cm. The height of the written area varies from about 14.5 cm to about 15.0 cm. There are 22 lines per page There are 72 extant folia. Quires: In his original 1958 publication Kasser stated that P.Bodmer 3 was made of 7 quires of text, each quire containing six sheets arranged after the classic manner →↓, ↓→, →↓, etc. (Kasser, Papyrus Bodmer III, iii). In his 2001 follow up, Kasser again affirmed 7 quires of 6 sheets each but admitted that his view of the fibers was too optimistic. His updated chart of the layout of the fibers shows no discernible pattern (Kasser, “Le Papyrus Bodmer III Réexaminé,” 85-88). Sharp makes one minor correction to Kasser’s updated layout of the pages (Sharp, “Papyrus Bodmer III,” 18-24). No quires survive intact. Individual leaves are mounted under glass, including one pair of leaves that is mounted as an intact bifolium. Cover: Only half of the cover is currently extant, although it is extant in two pieces, which are actually two halves of a quire that was part of the book block. Originally the back cover was a quire of several sheets of papyri glued together and folded in the middle. This “cover quire” was secured to the other quires by thread running through a leather stay (the other quires were secured with a parchment stays). This final “cover quire” had a leather cover glued around the outside of it that was folded over the inside edges of the “cover quire.” Some of the outer pieces of papyrus from the cover have come loose and traces of Greek writing can be found underneath. This writing remains unpublished. Binding: The binding appears to have been a link-stitch at two independent pairs of sewing stations. Parchment stays are found in the centers of the quires. Paratextual features: The Gospel According to John ends with the title ⲉⲩⲁⲅⲅⲉⲗⲓⲟⲛ ⲕⲁⲧⲁ ⲓⲱⲁⲛⲛⲏⲥ (Gospel According to John)(End of John page 139). The beginning of the gospel is not extant and it is not possible to tell if it had an opening title. 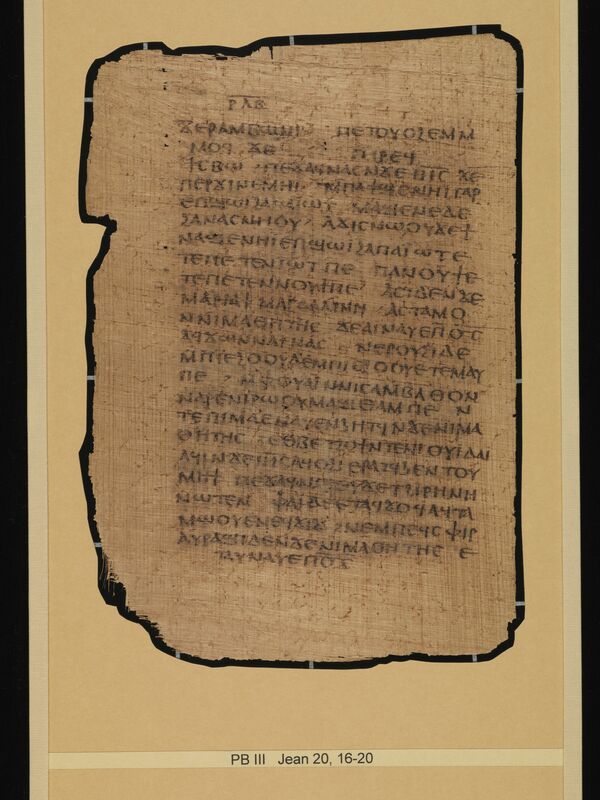 Genesis begins with the title ⲅⲉⲛⲉⲥⲓⲥ (Genesis)(Beginning of Genesis page 1) but does not have any markings at the end of the text (End of Genesis page 19). Both titles are centered to the middle of the page and surrounded by horizontal lines above and below the letters. The end-title of the Gospel According to John is more ornate, with multiple forked paragraphoi and diples surrounding the title. The pagination of the codex starts over with the beginning of Genesis. The main scribe of this codex habitually draws a line over the first letter, or two letters of every page. The only exceptions to this are on pages ⲙ̅ⲅ̅ and ⲣ̅ⲗ̅ⲏ̅. The reasons for this decorative stroke or why they are omitted in these two instances are unknown (Sharp, Papyrus Bodmer III, 30-32). There are 7 instances where one or more letters appear at the top of a page in addition to the page number. This usually consists of a ⲡ sometimes ⲡⲁϥ (Genesis Page 13). Decorations: Forked paragraph and diples flank the titles. RésuméPapyrus codex containing the Gospel According to John in Coptic (proto-Bohairic). Kasser, Rodolphe. Papyrus Bodmer III: Évangile de Jean et Genèse I-IV, 2 en bohaïique. CSCO 177-178. Scriptores Coptici 25-26. Louvain: CSCO, 1958. Kasser, Rodolphe. “Le Papyrus Bodmer III Réexaminé: Amélioration de sa Transcription.” Journal of Coptic Studies 3 (2001): 89-112. 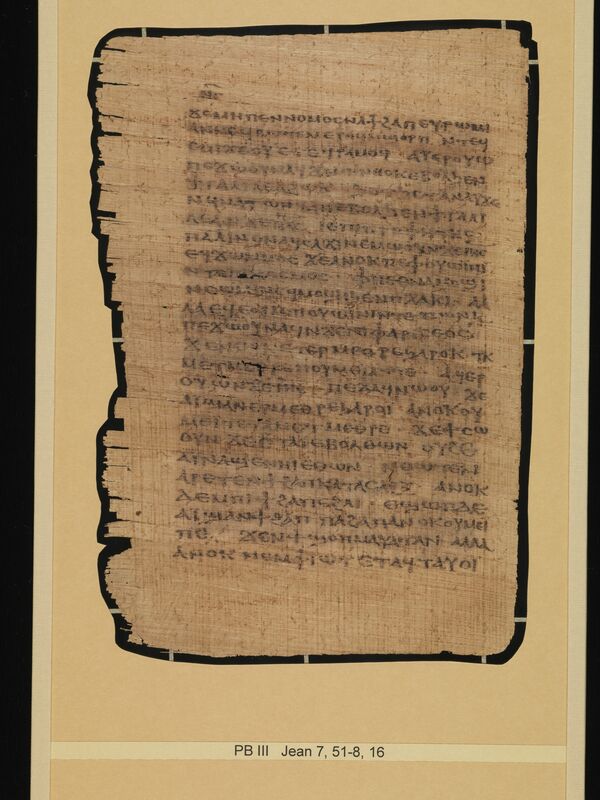 Sharp, Daniel B. Papyrus Bodmer III: An Early Coptic version of the Gospel of John and Genesis. Arbeiten zur neutestamentlichen Textforschung, Berlin; Boston: De Gruyter, 2016.